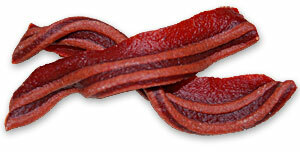 Looking for the zaniest of bacon products this lovely spring weekend? We’ve got you covered, and then some. This year is even better than last. Let’s begin with our friends at Green Works, a product I personally use and love. (This is not a paid endorsement, I’m just a fan.) I didn’t think their cleaners could get more delightful, but oh how wrong I was. Dammit all, I want to jump on aÂ trampoline with a piglet. For more information, check out the Green Works blog. Big ups to readerÂ Elizabeth for this one! Next we have a product for our faithful friend, the cat. Fresh Step is a trusted name in kitty litter, so of course they’re thinking of its users’ happiness and sensory pleasure. Litter is, after all, about covering the worst of odors. But why not go a step further, and make the litter box a boon to the whole household? Want to learn more? Check out their website and find out how you can get involved in the campaign to make kitty litter tasty again. I know Naseem and her feline overlords have already placed their order. This is the end all, be all. Literally. Couldn’t you just die? Okay, enough of that. Check out the full story at their blog. And thanks to my good friend and bacon enthusiast Genna for always being on the lookout. We hope everyone is having a great weekend, full of fun surprises!